Now I realize by now you may be royal wedding-ed out. But I do hope you’ll indulge me for this special edition post as I dish out my observations on the big event, connoisseur-style. It is common knowledge on this blog that I am a devoted Francophile but not many of you know that I am also a hopeless Anglophile as well (after all, I did marry an Englishman!) So of course last Friday’s royal wedding was a complete treat for me- as it was for over 2 billion people around the world. The bride looked beautiful. Her wedding dress, pitch perfect- the lace sleeves were reminiscent of Princess Grace. She exuded elegance. Her bouquet was a lesson in restraint. She purportedly did her own makeup which boggles my mind- she opted for a slightly heightened variation of le no makeup look. Her hair, simple and unfussy. She is a class act. Prince William- dapper and doting and very handsome. I will admit, I always wanted to marry Prince William, but as you have probably already figured out, that didn’t happen and as I tell my husband, I got the next best thing! (It’s always good to tell one’s husband things like that). Prince Harry’s cheekiness was refreshing and very attractive. I loved the hats! I hope seeing all of those gorgeous hats that were burgeoning on art pieces brings back the fashion of wearing hats to more than just special occasions. I must say that the most alluring hats were the ones that complimented the ladies’ outfit and did not overtake their face. There were a few questionable choices made. I will not name names but you probably know who I am referring to. As a side note, A few years ago I attended a beautiful English wedding in Stoke Poges at the Stoke Park Club and got to wear a hat for the first time (pictured above). Wearing a hat really adds a heightened sense of drama to an outfit. I sadly had to leave my hat in England as it did not fit in my luggage, and I long to be reunited with it again! Pippa Middleton, sister of the bride / maid of honor, looked stunning in her alluring cowl neck white dress. What a figure! The fact that she wore white was also very fresh and modern, although I hope it does not spark a trend across the world for wedding guests to wear white! The only reading in the ceremony, done by Catherine’s younger brother James, astonished me. His public speaking skills were excellent! I can’t imagine doing a reading in Westminster Abbey for all of those esteemed guests and 2 billion people watching all over the world. At my good friend Juliana’s wedding in Miami a few years ago I was asked to read a Shakespearean sonnet during the ceremony and out of nowhere broke into tears halfway through the reading. They were tears of joy for my good friends, of course, but no matter what the reason, it is not pleasant to break into the ‘ugly cry’ in front of a hundred guests, so I can only imagine what would happen if I were to do a reading at a Royal Wedding. I suppose it’s best I wasn’t asked. The procession, the uniforms, the horses, the carriages, the tradition, the pomp and circumstance of it all enchanted me… we don’t have that in America and it is thrilling to see. To celebrate the royal wedding I threw a tea party for 10 of my girlfriends. 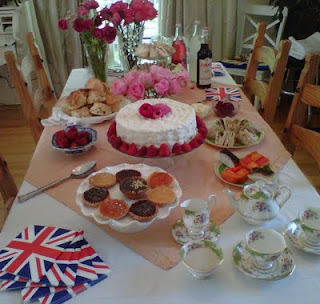 I had it catered by the Tudor House Tea Room in Santa Monica as I did not have time to make the food myself (although if I had had the time I would loved to have done so). We served five different kinds of tea sandwiches (cucumber, smoked salmon, turkey cranberry, chicken curry and cream cheese herb and walnut), currant scones with clotted cream and farmer’s market raspberry jam, various confections and mini tarts (including apricot, chocolate, and lemon), fresh strawberries with cream and a large sponge cake with buttercream frosting. Yum. To drink I decided to go with Mr. Connoisseur’s suggestion of Pimm’s cocktails (a splash of Pimm’s gin with lemon soda, ice and a twist of lemon rind), and French berry lemonade for the ladies who did not want Pimm’s. I gave away commemorative tea towels (pictured above) as presents to each guest. All in all it was a lovely day spent with friends to celebrate a lovely occasion. Cheers to Prince William and Catherine Middleton the new Duke and Duchess of Cambridge. May they have a very happy life together. ** Please note, this special Sunday post will take the place of the regular Monday evening post. Join me again this Thursday for a special skin care review. ** I would like to send my prayers to the families that have lost loved ones on 9/11 and send a thank you to our troops. God Bless America! The picture of the Duchess of Cambridge is courtesy of Access Hollywood. Before I announce the winner of the Love Quotes Scarf Giveaway I would like to thank you for all of your great comments. Hearing what you enjoy reading about on The Daily Connoisseur has given me insight on what you would like to read more of! Many of you said your favorite part of the blog was the series on The Top 20 Things I Learned While Living in Paris. For those of you longing for more, you will be happy to know the book is coming along swimmingly and is full of expanded thoughts of the lessons I learned as well as many stories I’ve never shared before on the blog… thank you for your patience. I promise the wait will be worth it! Upcoming videos on the channel will be: beloved etiquette books, a review of my kindle, my two favorite concealers and bad hair day remedies. Visit: www.youtube.com/TheDailyConnoisseur for more information, or to subscribe. The winner was picked at random (I drew the names from a hat). Congratulations! Please email me your shipping address so I can send you your new scarf. For those of you who didn’t win… over the next few months I will be doing more giveaways including one of a limited edition Jo Malone cologne as well as a giveaway for limited edition Stella McCartney perfume, so stay tuned! My recent post on the search for a new signature perfume received a tremendous response. I loved hearing your thoughts on signature scents and the ones that you love! Since then I have indeed gone on the hunt. The ensuing posts related to this topic will describe the various fragrances I’ve sampled on my road to finding “the one”. I will admit that I have felt somewhat intimidated at the daunting task of describing these scents accurately. 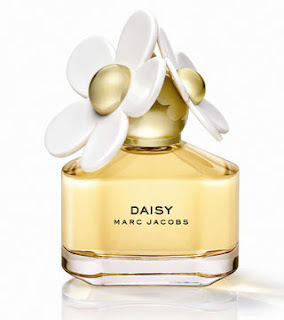 Perfume is such a personal thing- different notes do different things to different people. Therefore, my reactions to the various perfumes might not (and will probably not) be the same as your reactions. It all depends on what you are privy to. Black Orchid is a perfume I have tried in the past and have previously reviewed on my blog. It’s been a few years so I decided to try it again and see if my thoughts remain the same. 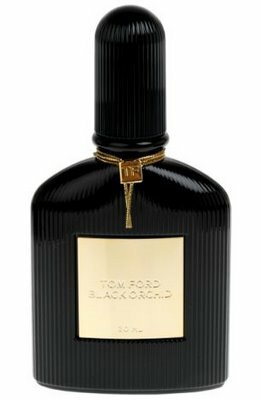 Tom Ford Black Orchid is a deep, sensual fragrance- very heavy but not too overpowering, making it perfect for fall and winter or even early spring when it is still cold outside but the warm weather is burgeoning and on its way. The scent is rich and luxurious, making one feel as though perhaps they were a femme fatale riding the Orient Express in Agatha Christie’s famous novel. The spicy accord to the scent suggests one who has visited exotic places. Main notes include: bergamot, citrus, mandarin, ylang-ylang, black gardenia, patchouli and orchid. While I found this fragrance mysterious and moving, I am not certain if it could be my signature scent and will keep looking. 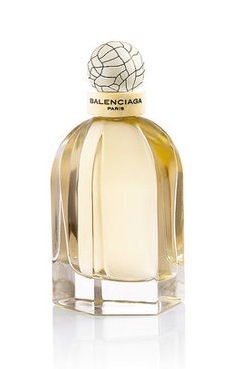 As you can imagine, I am already partial to a scent that is called Paris, so I thought I’d give Balenciaga Paris a try. Paris is a very sophisticated scent. It is a powdery, creamy violet that turns slightly woodsy after an hour or so of wear. The fragrance is minimalist, yet modern- there are not a lot of complexities to it- but the general sensation is that it is very pleasant. One of the criteria for my new signature scent is that it be bold- but not too bold. I would like to be able to wear it everyday and not tire of it. The bottle and packaging is quite beautiful. It has a an art deco feel to it. I could easily see this sitting on my counter and fitting in quite nicely amongst my toiletries. I am not certain if this is a contender… the violet note is lovely, but I am starting to miss my favorite rose note. Perhaps I will return to this another day. 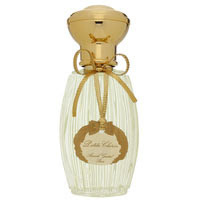 Without even knowing the story behind how Annick Goutal created Petite Cherie for her young daughter, I could have guessed. Petite Cherie is a precious little scent. It is a pure and innocent smelling fruity floral with not a lot of staying power. I could easily see spritzing this on myself after a shower on a fresh Spring day. The main notes are peaches, pears, musk, rose and vanilla. It is, overall, a very pleasant scent- but probably not my signature scent. I need something bolder and less sweet. If you haven't already entered the giveaway for the beautiful Love Quotes scarf... it isn't too late! I will announce the winner this Thursday. Thank you for helping me celebrate the launch of my new YouTube channel. Check in periodically for new uploads. This weeks uploads include What to Wear to the Theatre (already uploaded) and My Three Favorite Teas (upcoming). I am very happy to announce that The Daily Connoisseur is now on YouTube! This YouTube channel will act as a supplement to my blog. In my inaugural video I show you how I wear my own favorite red scarf. As you know I love to blog about the French lifestyle and in France scarves are a must have accessory. Love Quotes scarves, made out of high quality Italian linen, are my favorite because they are generous and luxurious in fabric- allowing you to wear them several different ways for a dramatic look. Also Love Quotes is a great company because they donate 10% of all of their profits to international children’s charities. I am giving this scarf away (an $89 value!) to one of my dedicated readers. To be eligible to win you must either be a follower, email subscriber, kindle subscriber or YouTube subscriber of The Daily Connoisseur. Please leave me a comment on this post (www.dailyconnoisseur.com) telling me your name and which of the above ways you follow the blog. Then briefly tell me which topic you most enjoy reading about on The Daily Connoisseur. ** Please note I am enabling the ability to leave comments as an anonymous user so you do not need a blogger account to enter. If you leave an anonymous comment, don't forget to tell me your name in case you win! Last week’s post Clutter-Free Home Part 1 received a great response. I got emails and comments from many of you who are dealing with issues of clutter. It seems many of us have the same issue. We have general control over the whole house but there are one or two areas that are our Achilles heel- the home office (mine), the dining room table or various cluttered drawers or storage spaces. Some of you brought up the concern that a home should not be stripped bare of character in the pursuit of banning clutter and I couldn’t agree more! I am not talking here about collectibles or treasured items. One definition of clutter is anything in your home that you don’t absolutely love. Perhaps you received a housewarming gift from your well meaning neighbor, Gladys- a porcelain statue of a frog, let's just say. You don’t actually like the frog statue and it certainly doesn't go with your modern Zen decor, but you hesitate to get rid of it so as not to hurt dear Gladys's feelings. You decide to store it in your coat closet. Every time you open your coat closet you see the frog and feel feelings of guilt and irritation. That is clutter. (Honestly, this frog analogy is a bit bizarre, but hopefully you see my point). Clutter is also an accumulation of miscellaneous things that do not belong where they currently are. Keys, cell phone and wallet in the middle of the dining room table are one example. Or a pile of unsorted mail on the piano is another example. Generally your gut can tell you what clutter is. You know deep down because to look at it aggravates you. Once you decide where your pockets of clutter exist, it is time to tackle them. As with clearing out your wardrobe go slowly and do not take on more than you can handle in a given session. There is nothing worse than having lofty ambitions, pulling out the contents of an entire closet and realizing a half hour later you would like to be done for the day and go to lunch but have only sifted through 1/3 of your mess. Be realistic and realize that accomplishing one small task a day (be it one junk drawer, one pile of filing or one section of the closet) can boost morale and keep you enthusiastic about tackling the next day’s task. Of course from a clutter stand point it would be a lot easier if we just lived alone and followed our own clutter management system. But then we might get lonely and life would be no fun. So we need to figure out a way to coexist harmoniously with our husbands or wives, children, pets or roommates without becoming a clutter-controlling tyrant. As I have mentioned before I believe Famille Chic (and my Californian French friends) had the entire household on board with keeping the clutter at bay. It was not just the women concerned with the issue of keeping a tidy and orderly home- it was the men too. The men seemed particularly respectful of keeping their things in the proper place. So how does one ‘train’ members of the family without coming across as bossy, neurotic or a nag? Asking nicely, gentle reminders and subtle interventions are needed here. Saying things such as, Honey could you try to not be such a slob? don't work (trust me, I say this from experience). If asking nicely and gentle reminders do not work perhaps a sit down meeting is in order. If possible provide a cup of tea and a slice of cake at said meeting- anything to make the new system seem more enjoyable to the trainee. Our hall closet was horribly stuffed. There were so many coats and jackets hanging in there, if a guest came over, there wasn’t room for their coat! So the guest’s coat and handbag would inevitably go on the back of a dining room chair- not a good look. Especially if they are over to dine and then you need to find a space for their coat once everyone goes to the table. The whole situation bothered me. I would dream about having someone over, asking if I could take their coat, and hanging it neatly in the hall closet. But in reality if I did that and opened the door, there was a very good chance that tennis rackets, umbrellas and other miscellaneous objects would fly out- embarrassing us all. The hall closet should have only the coat you will wear that day. Since it’s just me and my husband (baby doesn’t hang her coats yet), there should only be two coats hanging and around 4 padded or wooden hangers for our guest’s coats. Same with shoes. We were using our hall closet to store every shoe we’ve ever owned. There were so many shoes, they were piled on top of the vacuum cleaner (it is necessary for us to store our vacuum cleaner in the hall closet)- so every week when the housekeeper pulled out the vacuum, she would scream (and probably silently curse me) when a pile of excess shoes jumped out at her. I ended up pulling everything out of the closet and as you can probably guess, a lot of it was headed for the trash can or charity bin. I found old travel pillows, receipts, 10 year old Ugg boots (!) and exercise equipment we’ve never used! We can hold on to so much stuff- much of it we no longer want or will never use. And when you live in a condo like we do- space is precious. Here I was using valuable real estate in the hall closet to store old shoes that I didn’t even want, while necessary clutter that should have been hidden away in the closet (like handbags, keys, wallets, sunglasses, mail to be sorted etc.) was forming untidy piles on our dining room table. Yes I call those things necessary clutter. Because they are necessary items we use everyday- they just need a home out of eye’s sight as they tend to be loose-leaf and unsightly (especially when stored in the incorrect location). After going through the closet I hung an over the door storage unit to house our miscellaneous items… Now I just need to have that talk with my husband about actually using it! I better go get the tea and cake. These two homes stand out in my mind like something out of a horror film (or at least out of that reality television show entitled 'Hoarders'). They each were so massively cluttered with stuff- everything you can imagine from books, to paperwork to Christmas decorations to clothes to miscellaneous junk. Every counter top- every space was filled with something. The effect made my skin crawl. For the first home we toured, the actual owner and not the real estate broker, gave us a tour (I’m still not sure why this happened- but it did). The woman was probably in her mid-sixties and warned us about the clutter before we entered the home. She said, “You will see there is a bit of clutter- it’s just the state of my mind right now”. I remember thinking, how true that statement was. Clutter is a definite reflection of our state of mind. This woman’s house was overcome with clutter- she must have been going through a hard time. It got me thinking. In my house I have small pockets of clutter- but clutter, nonetheless. I try to keep the main rooms and surfaces clear, but there are corners or piles where clutter just naturally forms. So what does this say about my state of mind? As I have mentioned before, Famille Chic not only didn’t have pockets of clutter- they didn’t even have an ounce of clutter. Madame Chic's clutter-free home continues to act as a model and motivator for me- I know it can be done! As a side note, last year I befriended a French couple that lives in California. They graciously had me as a guest in their home and gave me a tour of their beautiful and modern living space. I remarked with amazement that I didn't see any clutter in their home. They laughed knowingly and shrugged their shoulders. I think they might have heard that before from previous American guests. Which makes me wonder- do they teach a mandatory course on clutter management in the French school system? Or is maintaining a clutter-free home merely in their blood? The de-cluttering process I’m going through in my own home is rather thorough. My plan is to eradicate clutter for good and I am happy to report that I am making breakthroughs. I have surmised that the pockets of visible clutter exist because our hidden storage spaces (any closets, drawers, etc.) are also cluttered, thereby not providing the proper space for our things. Our clutter pockets are symptoms of a greater problem- the general lack of organized systems in our home. Next week, in part 2, I will explore the de-cluttering process further, including my personal experience with banning clutter for good and musings on the necessary mindset behind having a clutter-free home. I would like to know... do you have issues with clutter? 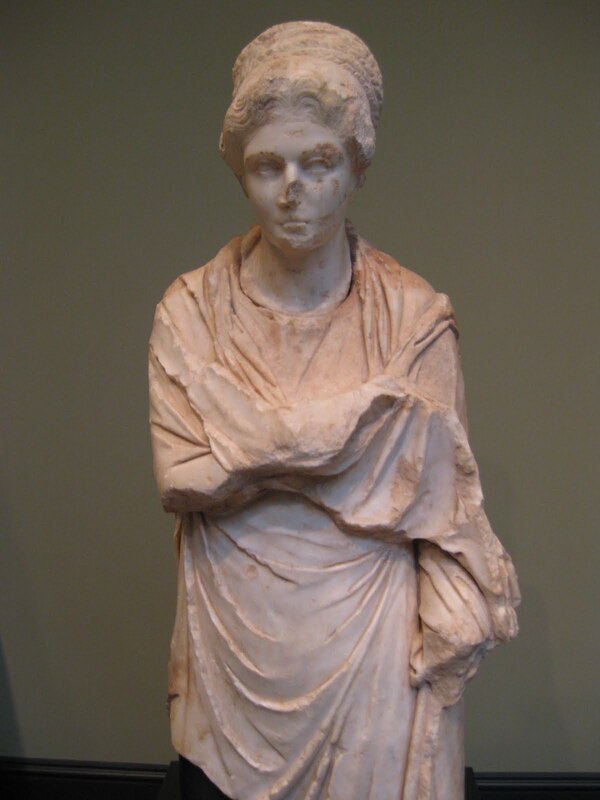 The bust of the young woman above is in marble and dates back to A.D. 120 - 130. She is thought to be from Cyme which is now present-day Turkey. Her braided hairstyle was popular during the reign of the Emperor Hadrian, who ruled between A.D. 117 - 138. She can be found in the Getty Villa, Malibu. My whole life I have been fascinated by the perfect red lip, but have been too intimidated to wear it. My fascination stems back to when I was a child and my mother and I used to watch classic films from the 40s and 50s. Rita Hayworth, Katharine Hepburn, Ginger Rogers, Elizabeth Taylor… Those film sirens were so glamorous. Everything about them- their hair- their makeup, the way they talked. I wanted to be just like them. In those glitzy movies from the golden age of Hollywood it seemed that everyone donned the perfect red lip- both day and night. In fact, just this weekend I re-watched Hitchcock's brilliant Dial M for Murder and noted with amusement that Grace Kelly's character, Margot Wendice, wore the perfect red lip throughout the entire film until the end when she had just been released from death row. I believe her not wearing her red lipstick at that point in the film was a conscious choice made by Hitchcock to convey that Kelly's character had been extremely stressed - nothing else had changed about her appearance- she still looked fabulous and her hair was even done. The only thing that changed was she wasn't wearing her red lipstick! The perfect red lip is a look I’ve tried in the past but have shied away from for one reason or another. Either I felt it was too much for daytime or I felt my lips looked too big… and then there is the question of eating… how on earth do you eat lunch while wearing the perfect red lip? I decided the only way to conquer my fear was to consult a professional. I sat down with Shadi Molavi, beauty expert and makeup artist with Chanel in Bloomingdales, Santa Monica to get her thoughts on the perfect red lip- and see if I could make it work for me. After all, the defined lip variation of le no makeup look is one of my favorite looks. It’s a glamorous and passionate look and one, I learned from Shadi, that is highly achievable. Find the right shade for you. For brunettes and women with olive complexions it is best to find a red color with tinges of blue in it. For Blondes or people with fair skin that have a tendency towards redness (such as rosacea) it is best for go for cherry reds or reds with pink undertones. The red lip can absolutely be worn during the day if it is the main feature of the face. Look at your face like a triangle, with the eyes as two points, scaling down to the cheeks then the lips. Only one of the three areas of the triangle (eyes, cheeks or lips) should play the starring role- not two, and certainly not all. Following this rule can help you avoid looking overdone like a clown. Shadi suggests that to wear the red lip during the day it is best to use only mascara to define the eyes and a subtle blush for the cheeks. For night play it up with an eyeliner. To apply always use lip liner. Start by lining the lips and then feathering the liner in, avoiding the central area of the lip. Then apply your lipstick or gloss. In my case, I used Chanel’s best selling Rouge Allure Laque no. 75 in Dragon (pictured above). If you wish to make your lips look fuller, you can apply clear gloss in the center of the lip on top of your lipstick. Use foundation or brightener on the skin around the mouth to highlight the lip and make it appear expertly applied. This will give you that professional polish those 40s film stars had. Apply a lip stain that will last all day. You can apply the stain and then a clear gloss on top to create a moisturized look. You will not have trouble with your red lip color coming off while eating if you do this. If you don’t want to wear a lip stain, you can fill in your entire lip with the lip liner before applying your lipstick. This will not ensure that it does not come off while eating but if you’re careful the lip liner can help to preserve the look while you lunch. If you are really concerned that your lipstick will come off (or end up on your chin) while eating, you can take it off all together and reapply after lunch. After meeting with Shadi and purchasing my Rouge Allure Laque in Dragon I met up with some girlfriends for lunch to test out the red lip. It lasted quite a long time- that is until I forgot I was wearing it (I rarely wear bold color during the day, you see) and smeared it with my napkin down my chin! But thankfully I was with girlfriends who told me instantly. Wearing the red lip and channeling my inner 40s screen siren will take some practice. I’ve since worn it twice during the day and with greater success each time. I would love to know… do you ever wear the perfect red lip? 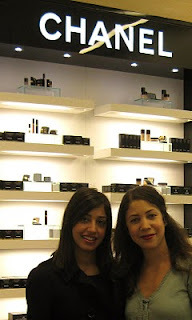 Above Shadi (left) and I are pictured at the Chanel counter in Bloomingdales, Santa Monica.